The global blood group typing market is prophesied to gain impetus from the increasing number of applications in various types of tests. As noted by experienced analysts, antibody screening could draw a greater growth in the market due to the intensifying demand for the early diagnosis of diseases and swelling prevalence of chronic diseases. Likewise, there could be certain techniques such as polymerase chain reaction (PCR)-based and microarray expected to significantly improve the demand for blood group typing. Having that mentioned, the authors of the report foresee more factors that could up the growth of the market in the near future. Rising at a CAGR of 5.6% during the forecast period 2017–2022, the global blood group typing market is prognosticated to be valued at a US$2.5 bn by the end of 2022. In 2017, the market attained a valuation of US$1.9 bn. The world blood group typing market is envisaged to be segregated into instruments, consumables, and services as per a segmentation by product. According to the researchers, the consumables segment could exhibit an outshining growth in the market while raking in a staggering revenue of US$1.0 bn by the end of 2022. In 2017, it earned a share of 42.0% in the market. In view of a segmentation by end user, the world blood group typing market is projected to see a classification into clinical laboratories, hospitals, blood banks, and other end users. By test type, players could embrace business opportunities created by antibody screening, human leukocyte antigen (HLA) typing, ABO blood tests, cross-matching tests, and antigen typing. In terms of type of technique, there could be important segments such as massively parallel sequencing, assay-based techniques, PCR-based and microarray techniques, and other techniques. The international blood group typing market is envisioned to be segregated into developed and developing regions, where North America could top the list of attractive geographies for revenue growth. By the completion of the forecast period, North America is anticipated to collect a revenue of US$0.8 bn, although its CAGR could be lower than that of few other regions in the market. Europe is predicted to grow at a CAGR of 6.7% and offer lucrative prospects for companies operating in the international blood group typing market. With a 22.4% share achieved in 2017 up its sleeve, Asia Pacific except Japan (APEJ) could be another attractive region for players to capitalize on the opportunities offered. Japan, on the other hand, could lose 59 basis points (BPS) between 2017 and 2022 and account for a smaller share in the market. The Middle East and Africa (MEA) is expected to be no different than Japan in terms of revenue growth. It could reach an only US$0.08 bn by 2022 end. The worldwide blood group typing market could be marked by leading companies such as Bio-Rad Laboratories, Inc., Merck Millipore, Ortho Clinical Diagnostics, Inc., Danaher Corporation, Grifols, S.A., Immucor, Inc., Quotient, Ltd., Bag Health Care GmbH, and Agena Bioscience, Inc. The global blood group typing market is prophesied to showcase a healthy growth while expanding at a strong CAGR during the forecast period 2017–2022. Some of the factors that could propel the demand for blood group typing are the elevating usage in forensic sciences, requirement of blood grouping during prenatal testing, and mounting requirement of blood and blood products. Besides these, the rise in the number of trauma cases and road accidents that require blood transfusion is envisaged to set the tone for growth in the market. This publication is considered by most readers as an all-embracing tool for directing their paths into the right direction when securing a robust growth in the global blood group typing market. It provides a complete study of the market with important aspects taken into special consideration. 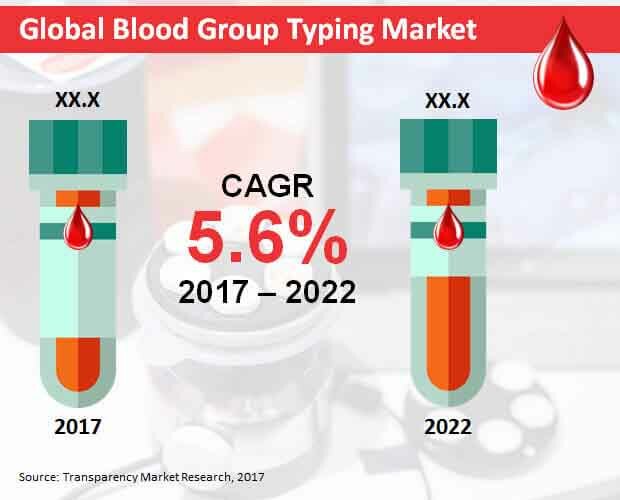 The world blood group typing market is prognosticated to collect scores of growth opportunities birthing on the back of powerful end users significantly improving the demand while riding on various factors. Seasoned analysts base their end-user analysis on the viewpoint that hospitals could grow at a higher CAGR than other segments in the category. This is expected to be attributed to several factors such as the rising requirement of blood in surgical procedures, increasing count of blood donations, and surging awareness about the importance and applications of blood donations. The international blood group typing market is anticipated to be classified according to product, end user, test, and technique. In terms of product, the market could receive a strong growth on the back of consumables as a larger segment expected to secure a 41.8% share by the end of 2022. The consumables market by product could grow at a US$0.04 bn annually during the forecast timeframe. On the basis of end user, the international blood group typing market is predicted to be segmented into clinical laboratories, hospitals, blood banks, and other end users. By type of test, there could be vital segments taking shape in the market, such as antibody screening, human leukocyte antigen (HLA) typing, ABO blood tests, cross-matching tests, and antigen typing. In respect of technique, the market is projected to be divided into massively parallel sequencing, assay-based techniques, polymerase chain reaction (PCR)-based and microarray techniques, and other techniques. Geographically, the international blood group typing market could include North America as a top region garnering a king’s share during the forecast years. The regional market is forecast to expand at a 5.0% CAGR. Europe and Asia Pacific except Japan (APEJ) could be other attractive markets for blood group typing. However, not much could be expected out of the slower growth of Japan and the Middle East and Africa (MEA). The worldwide blood group typing market could witness the presence of companies such as Bio-Rad Laboratories, Inc., Merck Millipore, Ortho Clinical Diagnostics, Inc., Danaher Corporation, Grifols, S.A., Immucor, Inc., Quotient, Ltd., Bag Health Care GmbH, and Agena Bioscience, Inc.